The influence of the US in craft beer continues to be huge as just about everyone seems to be brewing a NEIPA or a Brut IPA right now, but it’s important for the future of the Australian independent beer industry to not only reproduce what’s popular in the US, but also put its own stamp on it. Australia has top quality locally grown malt, hops, fruits and even native plants to use in beer. Here are a few breweries that put such Australian ingredients to good use and create compelling beers that you could only make Down Under. Bridge Road has long been one of Australia’s best breweries and a great promoter of the High Country area of regional Victoria and its local producers. They’ve brewed Single Hop IPAs showcasing Australian-grown hops and produced an annual harvest ale using fresh hop cones from a nearby garden. And now their Mayday Hills series has explored adding all kinds of local produce in the region to beer from green tea to strawberry jam. The Mayday Hills beers are all fermented in a foeder (a big wooden oak vat) to brew a diverse range of funky creative and pretty affordable top quality beers. The series has been a revelation for beer lovers who are looking for tastes that are new, different and a little bit daring. Endeavour has been a leader in using only Australian ingredients in their beer, the inscription on their beer labels reading “Australian owned and made from the ground up”. Relative veterans of the craft beer scene, Endeavour has been brewing since 2010 and take a unique approach for the beer industry as they lay claim to being the world’s only dedicated harvest brewer, selecting and sourcing barley and hop products from Australian growers on a seasonal basis. I was recently sent a tasting pack of the Endeavour core range. The beers I tried didn’t follow the latest trends or create new taste sensations like the other brewers on this list might, they were subtle beers, restrained in their use of hops in today’s climate with a clean straightforward taste. The Reserve Amber Ale was probably the most intriguing of the core range, a rich toffee malt flavour that I would usually expect from a scotch ale, but at a lower ABV. Their beers aren’t meant to be challenging, they are well-made Australian grown and brewed beers available at a very affordable price point and available widely at major outlets across Australia. Endeavour branches out a bit from their core range at their tap rooms in the tourist hub of the Rocks in Sydney. For instance, they recently served up a Native Ale using native ingredients of lemon myrtle, finger lime and Davidson plum, a beer that fits in nicely with their all-Australian approach. With the owners’ prior experience importing craft beers, it’s no wonder that they understand the importance of being able to sell their beer on their country’s unique attributes. The Nomad range of beers include additions of Australian fruits and plants like the native desert finger limes, wattle seeds, rainforest limes and bush tomatoes to name a few, as well as locally grown fruits like pomegranates and peaches. While the beers may reference common international styles like IPAs or Gose and often involve collaborations with some of their global brewing friends., each one has its own twist, and in most cases it works brilliantly. The Supersonic DIPA Rainforest Lime edition for instance was a lively fruity beer that could match the vibrancy of any hazy IPA, while using a native ingredient that’s never been seen in beer before. Aussie beer geeks have fallen in love with Wildflower since their launch last year. Count me as another who is lovestruck. Wildflower produce fantastically complex beers that perfume the nose and dance on the tongue. They use a mix of foraged wild yeast and naturally occurring souring bacteria native to New South Wales to produce uniquely different beers that are specific to their origins. 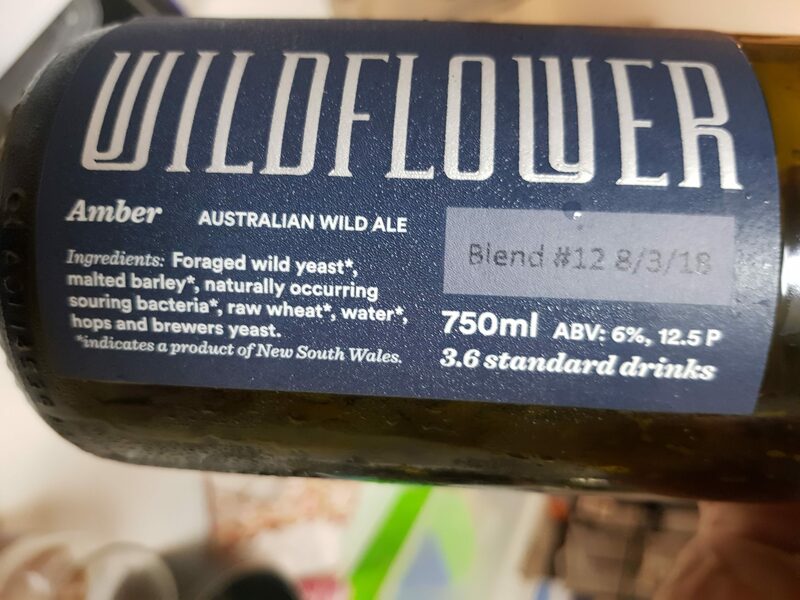 Aside from the cocktail of local yeasts and bacteria, their ingredients list for say the Amber Ale Blend #12 also highlights NSW ingredients of barley malt, raw wheat and water. How local is your local beer? Just how Australian is your local craft beer really? While the beer may be brewed locally, the ingredients may not be as many craft beers will use American hops like Citra and Cascade that are easier to access and may also use specialty malts and yeasts sourced from overseas. A few months back, food and drink products were required to display labels that clarify how Australian they are. The label shows a kangaroo and specifies things like where the food was grown, where it was packed, and the origin of its ingredients including the % of Australian ingredients. Beer isn’t held to these same standards of labelling but the more transparent and clear that brewers can be in the origins of beers including the processes, ingredients and ownership, the better in my opinion. Wildflower’s label that highlights all the products in the ingredients from their state sets a good example in this regard. When the industry promotes buying local, it can sometimes overlooks the value of local ingredients, which can be just as valid a reason for buying local – it supports sustainable production and distribution, and investing back into the community. People care about how Australian the products they are buying really are and drinkers who favour locally brewed beers when presented with the choice will also likely prefer locally grown. Australia is blessed with native fruits and plants, top notch locally grown barley malt and hops, and local microflora, all of which can make beer that nowhere else can do quite the same. The brewers who are making use of local ingredients are separating themselves from the pack and setting themselves up for the future.